Having started out with the aim of working in tourism, Montone quickly decided that wine was more interesting and, following a trip to Montepulciano in 2008, switched his focus to wine and hospitality. In 2012, he completed a sommelier course in his native Italy and moved to London in 2013, where he first worked at Aqua Shard. 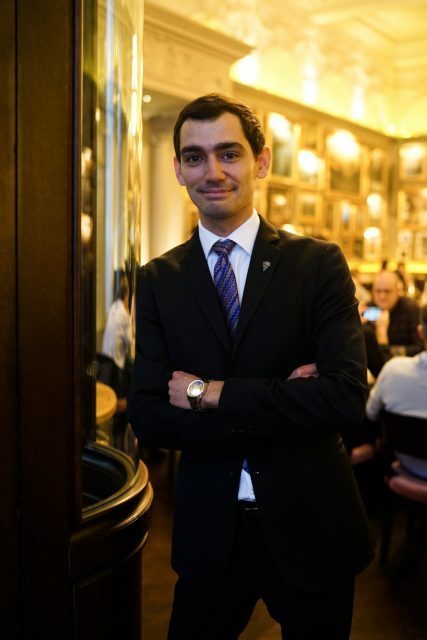 From 2014 to 2016 he found himself working as junior then deputy sommelier at The Ritz, before moving on to Locanda Locatelli as assistant head sommelier. In 2017 he joined Berners Tavern as head sommelier, and was later made director of wine. During this time, Montone has racked up an impressive array of awards and diplomas, including coming seventh in a competition of Italian sommeliers in 2015. He was a finalist in the 2018 Taittinger Sommelier of the Year competition, and in November he achieved his advanced certificate from the Court of Master Sommeliers. I was on a trip to Montepulciano in 2008 and had just finished studying tourism. It was then that I decided to continue studying, with a focus on wine instead. Without a doubt, the service element. I love interacting with all the guests, talking about the wines I am passionate about, that I think they will love too. That you drink a lot. Sure, I TASTE a lot of wine, but probably drink a lot less than the average person. I like to keep a clear head so I can study more about wine in the early mornings. Lager. From the bottle, ice cold. Not after every shift though, maybe twice a week. Dropping a full tray of drinks in the middle of a table of eight in my early days as a sommelier. If you could give your younger self advice when starting out as a sommelier, what would it be? Start studying wine earlier! And pay more attention to languages – you will need them. When a guest came to Berners Tavern and brought his own wine, and insisted on me tasting all of them too. It was such a memorable occasion that I even remember all the wines. Cristal 1990; Montrachet 2010 Romanee Conti; Coche Dury Corton Charlemagne 2005-2007. When they drink white Burgundy too chilled. It should be 10- 12 degrees. Giorgio Locatelli and Jason Atherton. Nebbiolo with anything white truffle related. A chef – even though I never cook! Rod Stewart – the funniest guest I’ve ever served. I think London is the wine capital of Europe – it feels like playing in the premier league. Slowcooked shoulder of Herdwick lamb, sugar snaps, peas and broad beans, roasted wild mushrooms and mint sauce, paired with Mount Edelstone Henschke 1994. The body and tannins of the wine compliment the texture of the dish, the flavour profiles of the wine work well with the flavours.